Angina pectoris, commonly known as angina, is severe pain in the chest that is caused by restriction in blood supply (ischemia) to the heart muscle, and thus insufficient oxygen supply to the heart muscle. In addition to pain, it may be characterized as localized pressure or discomfort in the chest, or as a feeling of choking, suffocation, or crushing heaviness (Larson 2004). It is occasionally experienced in the neck, arm, shoulder, or jaw regions (Larson 2004). The term angina, which comes intact from Latin and refers to a painful constriction or tightness somewhere in the body, is also used for other conditions. Abdominal angina is a postprandial abdominal pain that occurs in individuals with insufficient blood flow to meet visceral demands. Ludwig's angina is a serious, potentially life-threatening infection of the tissues of the floor of the mouth. Prinzmetal's angina is a syndrome typically consisting of cardiac chest pain at rest that occurs in cycles. Vincent's angina, or trench mouth, is an infection of the gums leading to inflammation, bleeding, deep ulceration, and necrotic gum tissue. Angina tonsillaris (tonsillitis) is an inflammation of the tonsils. This article will be about chest pain due to oxygen shortage in the heart muscle, in other words, angina pectoris. Major risk factors for angina pectoris include cigarette smoking, diabetes, high cholesterol, obesity, high blood pressure, stress, sedentary lifestyle, and family history of premature heart disease. Several of these risk factors can be lessened through changes in lifestyle, such as exercise, losing weight, and cessation of smoking. The myocardium is the muscular tissue of the heart, consisting of specialized cardiac muscle cells. 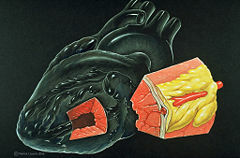 The blood supply of the myocardium is carried by the coronary arteries. Angina, or angina pectoris, is a gripping pain that is caused by an insufficient supply of oxygen-rich blood to the heart muscle, generally due to obstruction or spasm of the coronary arteries (the heart's blood vessels). Coronary artery disease is a main cause of angina. The term angina pectoris derives from the Greek ankhon, for "strangling," and the Latin pectus for "chest," and can therefore be translated as "a strangling feeling in the chest." It is not common to equate severity of angina with risk of fatal cardiac events. There is only a weak relationship between severity of pain and degree of oxygen deprivation in the heart muscle (i.e. there can be severe pain with little or no risk of a heart attack, and a heart attack can occur without pain). On the other hand, worsening ("crescendo") angina attacks, sudden-onset angina at rest, and angina lasting more than fifteen minutes are symptoms of unstable angina (usually grouped with similar conditions as the acute coronary syndrome). As these may herald myocardial infarction (a heart attack), they require urgent medical attention and are generally treated as a presumed heart attack. There are two main categories of angina: angina of effort, or stable angina, and unstable angina. Angina of effort, or stable angina, is the more common form of angina and occurs during periods of exercise, stress, or excitement. The arteries can supply adequate oxygen-rich blood to the heart muscle during rest, but not during these more active or stressful times. It is caused by atherosclerosis, a narrowing of the arteries. Typical presentations of stable angina is that of chest discomfort and associated symptoms precipitated by some activity (running, walking, etc.) with minimal or non-existent symptoms at rest. Symptoms typically abate several minutes following cessation of precipitating activities and resume when activity resumes. In this way, stable angina may be thought of as being similar to claudication symptoms. Individuals with angina of effort do have an increased risk of myocardial infarction (heart attack) (Larson 2004). Unstable angina (UA) is defined as angina pectoris or equivalent ischemic discomfort with at least one of three features: (1) it occurs at rest (or with minimal exertion), usually lasting more than ten minutes; (2) it is severe and of new onset (i.e., within the prior four to six weeks); and/or (3) it occurs with a crescendo pattern (i.e., distinctly more severe, prolonged, or frequent than previously). Unstable angina may occur unpredictably at rest, which may be a serious indicator of an impending heart attack. What differentiates stable angina from unstable angina (other than symptoms) is the pathophysiology of the atherosclerosis. In stable angina, the developing atheroma is protected with a fibrous cap. This cap (atherosclerotic plaque) may rupture in unstable angina, allowing blood clots to precipitate and further decrease the lumen of the coronary vessel. This explains why angina appears to be independent of activity. The term variant angina has also been used as a general term for angina that occurs at rest, unrelated to excessive work by the heart muscle, and occurs independently of atherosclerosis, which may or may not be present (Larson 2004). In many manifestations, it appears to be caused by a coronary artery muscle spasm of insufficient intensity or duration to cause a heart attack (Larson 2004). Most patients with angina complain of chest discomfort rather than actual pain: the discomfort is usually described as a pressure, heaviness, tightness, squeezing, burning, or choking sensation. Apart from chest discomfort, anginal pains may also be experienced in the epigastrium (upper central abdomen), back, neck, jaw, or shoulders. Typical locations for radiation of pain are arms (often inner left arm), shoulders, and neck into the jaw. Angina is typically precipitated by exertion or emotional stress. It is exacerbated by having a full stomach and by cold temperatures. Pain may be accompanied by breathlessness, sweating, and nausea in some cases. It usually lasts for about one to five minutes, and is relieved by rest or specific anti-angina medication. Chest pain lasting only a few seconds is normally not angina. Myocardial ischemia comes about when the myocardia (the heart muscles) receive insufficient blood and oxygen to function normally either because of increased oxygen demand by the myocardia or by decreased supply to the myocardia. This inadequate perfusion of blood and the resulting reduced delivery of oxygen and nutrients, is directly correlated to blocked or narrowed blood vessels. Some experience "autonomic symptoms" (related to increased activity of the autonomic nervous system) such as nausea, vomiting, and pallor. A variant form of angina (Prinzmetal's angina) occurs in patients with normal coronary arteries or insignificant atherosclerosis. It is thought to be caused by spasms of the artery. It occurs more in younger women. In angina patients who are momentarily not feeling any chest pain, an electrocardiogram (ECG) is typically normal, unless there have been other cardiac problems in the past. During periods of pain, elevation or depression of the ST segment may be observed. To elicit these changes, an exercise ECG test ("treadmill test") may be performed, during which the patient exercises to their maximum ability before fatigue, breathlessness or, importantly, pain supervenes; if characteristic ECG changes are documented (typically more than one millimeter of flat or downsloping ST depression), the test is considered diagnostic for angina. The exercise test is also useful in looking for other markers of myocardial ischaemia: blood pressure response (or lack thereof, particularly a drop in systolic pressure), dysrhythmia, and chronotropic response. Other alternatives to a standard exercise test include a thallium scintigram (in patients that cannot exercise enough for the purposes of the treadmill tests, for example, due to asthma, or arthritis, or in whom the ECG is too abnormal at rest) or Stress Echocardiography. In patients in whom such noninvasive testing is diagnostic, a coronary angiogram is typically performed to identify the nature of the coronary lesion, and whether this would be a candidate for angioplasty, coronary artery bypass graft (CABG), treatment only with medication, or other treatments. In patients who are in hospital with unstable angina (or the newer term of "high risk acute coronary syndromes"), those with resting ischaemic ECG changes or those with raised cardiac enzymes such as troponin may undergo coronary angiography directly. Increase in heart rate results in increased oxygen demand by the heart. The heart has a limited ability to increase its oxygen intake during episodes of increased demand. Therefore, an increase in oxygen demand by the heart (for example, during exercise) has to be met by a proportional increase in blood flow to the heart. reduced oxygen-carrying capacity of the blood. Atherosclerosis is the most common cause of stenosis (narrowing of the blood vessels) of the heart's arteries and, hence, angina pectoris. Some people with chest pain have normal or minimal narrowing of heart arteries; in these patients, vasospasm is a more likely cause for the pain, sometimes in the context of Prinzmetal's angina and syndrome X.
Myocardial ischemia also can be the result of factors affecting blood composition, such as reduced oxygen-carrying capacity of blood, as seen with seven anemia (low number of red blood cells), or long-term smoking. Roughly 6.3 million Americans are estimated to experience angina. Angina is more often the presenting symptom of coronary artery disease in women than in men. The prevalence of angina rises with an increase in age. Similar figures apply in the remainder of the Western world. All forms of coronary heart disease are much less-common in the Third World, as its risk factors are much more common in Western and Westernized countries; it could therefore be termed a disease of affluence. The increase of smoking, obesity, and other risk factors has already led to an increase in angina and related diseases in countries such as China. The main goals of treatment in angina pectoris are relief of symptoms, slowing progression of the disease, and reduction of future events, especially heart attacks and, of course, death. Medication often is used to control angina or reduce risk of heart attack. An aspirin (75 mg to 100 mg) per day has been shown to be beneficial for all patients with stable angina that have no problems with its use. Beta blockers (eg., carvedilol, propranolol, and atenolol) have a large body of evidence in morbidity and mortality benefits (fewer symptoms and disability and longer life) and short-acting nitroglycerin medications are used for symptomatic relief of angina. Nitroglycerin acts by increasing the diameter of blood vessels carrying blood to the myocardium (Larson 2004). Calcium channel blockers (such as nifedipine (Adalat) and amlodipine), Isosorbide mononitrate, and nicorandil are vasodilators commonly used in chronic stable angina. A new therapeutic class, called If inhibitor, has recently been made available: ivabradine provides pure heart rate reduction (Sulfi and Timmis 2006), leading to major anti-ischemic and antianginal efficacy. ACE inhibitors are also vasodilators with both symptomatic and prognostic benefit and, lastly, statins are the most frequently used lipid/cholesterol modifiers which probably also stabilize existing atheromatous plaque. The largest randomized trial of an anti-anginal drug to date is the ACTION trial. It included 7,665 patients with stable angina pectoris. ACTION demonstrated that the calcium channel blocker nifedipine (Adalat) prolongs cardiovascular event- and procedure-free survival in patients with coronary artery disease. For example new overt heart failures were reduced by 29 percent compared to placebo. This finding confirms the vascular-protective effects of nifedipine (Wilson et al. 2004). Ranolazine (Ranexa) is a new class of anti-anginal drug that was approved by the Food and Drug Administration (FDA). Surprising perhaps is that exercise is also a very good long term treatment for angina, although only particular regimes—gentle and sustained exercise rather than dangerous intense short bursts) (Ades et al. 1993). It probably provides benefit by complex mechanisms such as improving blood pressure and promoting coronary artery collateralization. Identifying and treating risk factors for further coronary heart disease is a priority in patients with angina. This means testing for elevated cholesterol and other fats in the blood, diabetes and hypertension (high blood pressure), and encouraging stopping of smoking and weight optimization. If the risk of heart attack remains high and angina pain is not reduced by more conservative treatments, then surgery (such as coronary artery bypass surgery) or angioplasty may be used (Larson 2004). Alternative treatments for angina include massage or kinesiological methods, or the use of cholesterol-lowering treatments such as consumption of garlic and herbal remedies such as alfalfa, tumeric, and Asian ginseng (Larson 2004). Ades, P. A., M. L. Waldmann, E. T. Poehlman, et al. 1993. Exercise conditioning in older coronary patients. Submaximal lactate response and endurance capacity Circulation 88(2): 572–7. PMID 8339420. Retrieved September 13, 2008. Larson, J. P. 2004. Pages 194-196 in J. L. Longe, The Gale Encyclopedia of Medicine, 2nd edition, volume 1. Detroit, MI: Gale Group/Thomson Learning. ISBN 0787654906 (volume); ISBN 0787654892 (set). Poole-Wilson, P. A., J. Lubsen, B. A. Kirwan, et al. 2004. Effect of long-acting nifedipine on mortality and cardiovascular morbidity in patients with stable angina requiring treatment (ACTION trial): Randomised controlled trial Lancet 364(9437): 849–57. PMID 15351192. Retrieved September 13, 2008. Sulfi, S., and A. D. Timmis. 2006. Ivabradine—the first selective sinus node I(f) channel inhibitor in the treatment of stable angina Int. J. Clin. Pract. 60(2): 222–8. PMID 16451297. Retrieved September 13, 2008. This page was last modified on 17 September 2008, at 22:40.